Little about On Kawara’s life is evident from looking at his work. 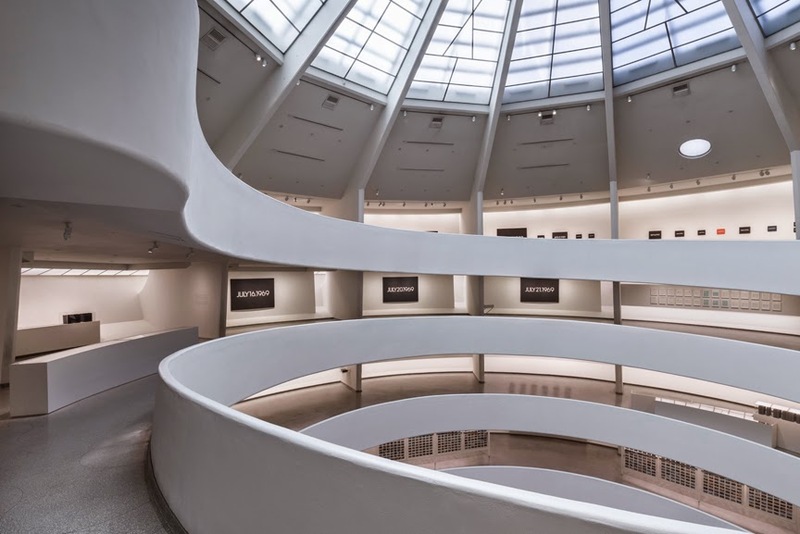 Much of his exhibition at the Guggenheim consists of compilations of journal-like data, which unfold like life itself – one day at a time. During my visit, I marveled at his organization, and at the patience and commitment it must have taken to maintain these projects for several decades. I imagined him living in a series of tidy, austere spaces over the years, surrounded by clean surfaces, folders, files, three-ring binders, rubber stamps, boxes of acetate sleeves, and a single portable typewriter. No clutter save perhaps for a few handsome, well-crafted objects. As I examined the binders that hold “I Met,” “I Went” and “I Read,” three series that chronicle his daily activities with lists, maps, and clippings, I’m uncomfortably reminded of the seemingly endless binders I put together for tenure and promotion. Did he take solace in the routine, or was each day a struggle to continue the tedious process that he had begun so long ago? 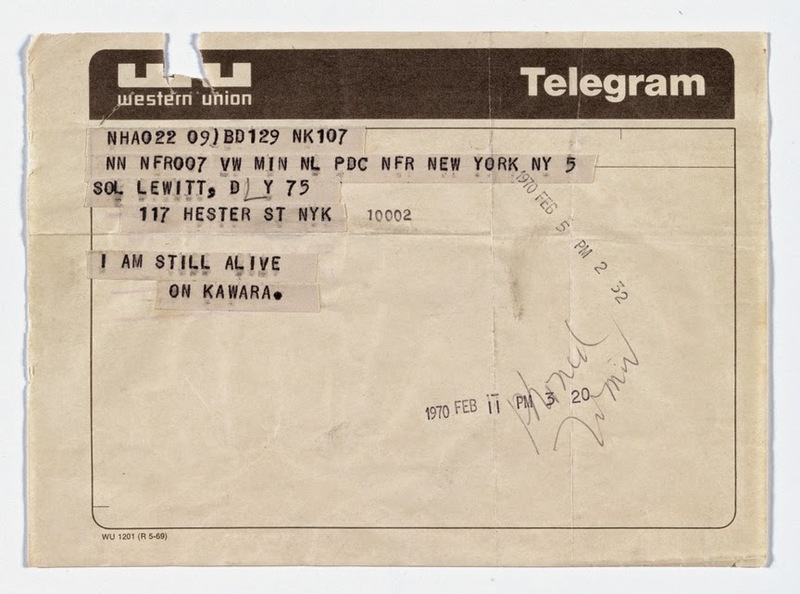 Unlike artists today, Kawara eschewed the limelight, even skipping his own openings because attending them would interrupt what he envisioned as a lifelong performance – tracking a single life, lived unremarkably. 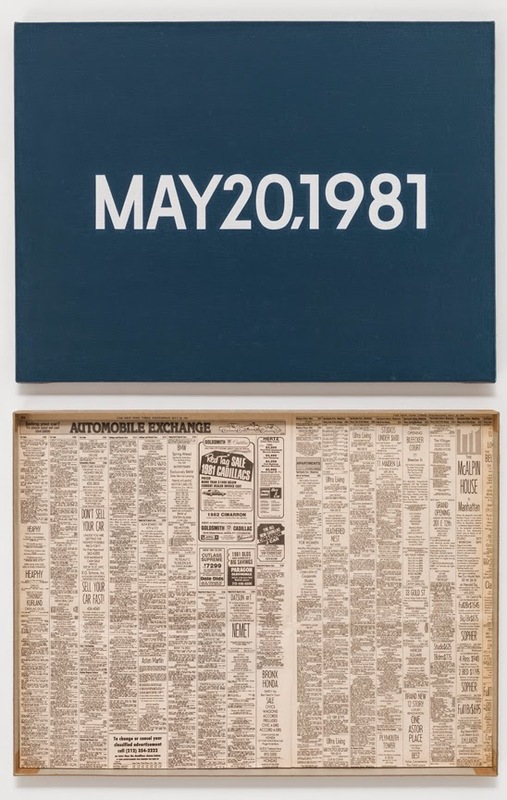 Rooted in the groundbreaking 1960s Conceptual Art practices developed by artists such as John Baldessari and Sol Lewitt, Fluxus, and Ray Johnson, Kawara’s work seems both to anticipate and to challenge the contemporary narcissism played out across social networking media. Where we err on the side of oversharing, Kawara was dedicated to undersharing. He provides simple details – what time he got up, where he went, whom he met – but no more. In the absence of a fuller story about him, we tend to look for ourselves in his work. I found myself scanning the information for personal connections and overheard other viewers doing the same. Did he make a painting on my birthday? On my daughter’s birthday? Did he meet with anyone I know? Were we ever neighbors? The “Date Paintings” form the core of Kawara’s endeavor. Each day, using the typeface Helvetica, he made a painting of that day’s date painted in white on a solid-colored canvas. The months were abbreviated as necessary, and Kawara punctuated according to the practice of whatever locale he happened to be in on that day – Berlin, New York, Tokyo, wherever. If he didn’t finish the painting before midnight, he destroyed it. Each painting is paired with a cardboard box lined with a piece of the newspaper from that day. Sometimes it’s the front page, but often the pages are from the sections further back, even the classifieds, as if to suggest that everything is equally important or, perhaps, equally unimportant. For him, our daily lives are inexorably fragmentary, just footnotes to the interminable passage of time. Through the rigorous and disciplined pursuit of projects begun in the 1960s, Kawara communicates his belief that the individual is ultimately insignificant. His daily “I Am Still Alive” missives, sent via telegram to friends around the world, get at the central existential reason for any correspondence or communication: to tell your pen pal, and more broadly the world, that you exist. The cold reality for Kawara is that death – one’s passing into history – is not only inevitable but ever closer. At the same time, as we contemplate his single-mindedness, admiring the fine details and subtle differences from one piece to the next, we begin to understand that only a brilliant artist can so elegantly articulate that insignificance and the human desire, however futile, to thwart it. We can’t stop time, but Kawara’s sobering achievement is that he inspires us to persist and make the most of our remaining days. 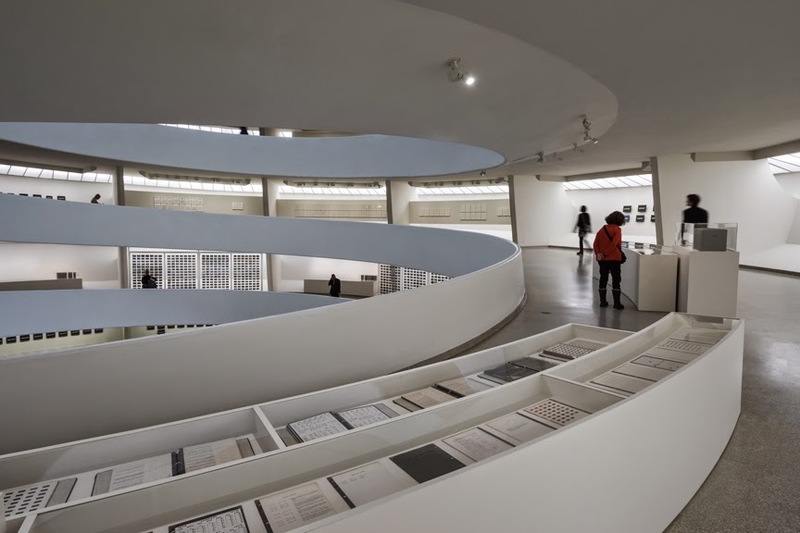 “On Kawara—Silence,” curated by Jeffrey Weiss with Anne Wheeler, Guggenheim Museum, New York, NY. Through May 3, 2015. This article and artist remind me of my friend Lisa Daria Kennedy who marks each day with a painting. for her this practice is way to mark the day, like crossing the day off of a calendar, her paintings celebrate the start of a new day and the completed painting notes that another day has passed. I think in completing the dailey painting which is what it falls under she is leaving behind an indicator that she too passed through this period of time and the painting is a reminder that she was present in the day. One can only admire the dedication here. Art as anthropology? I imagine tiday's artists would simply post the dates on Facebook in a kind of diachronic series.